As much fun as Slack is, it’s even better when you plug other applications into it. Our integrations page lists over 80 applications custom tailored to interact with Slack, and beyond that list we have thousands of developers using our API to build custom applications. But to date there has been a problem sharing custom apps for Slack — getting a copy of someone’s code, spinning up a server, and configuring incoming and outgoing webhooks is tedious and a lot of work. Today we’re taking the first step towards making it easier by debuting a streamlined way to share the custom integrations developers have written: The Add to Slack Button. Today this feature debuts in a dozen apps, with many more to soon follow. Let’s take a look at a few of them. Nuzzel is an amazing companion app for Twitter, scanning your followers and alerting you whenever multiple friends mention the same link. In practice, it does a great job showing you stuff you’re interested in by nature of the people you follow. If you’re into tech, you’ll get more tech news, if you’re into sports, your Nuzzel feed will alert you to the biggest sports stories. 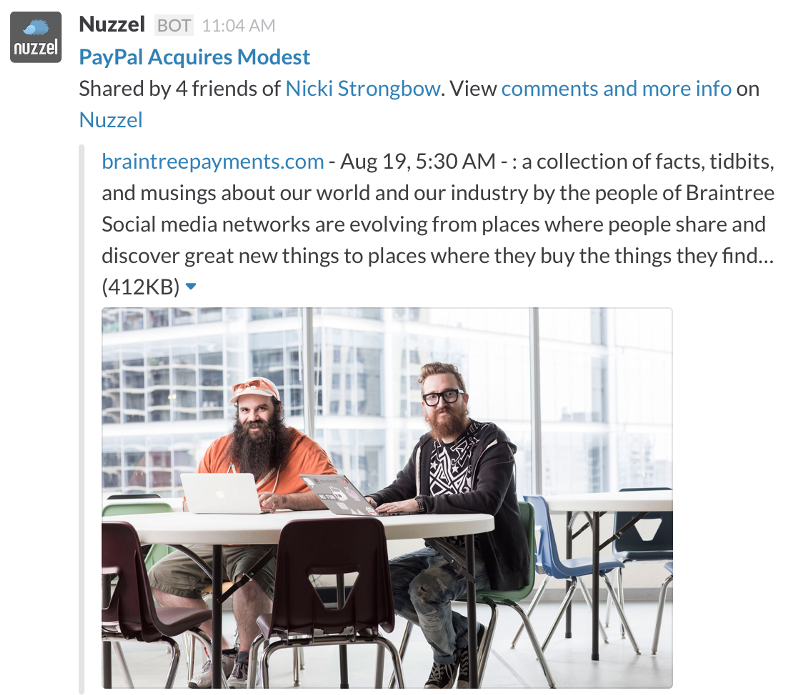 Nuzzel currently runs as an iPhone app and webapp, sending alerts to your phone and via email, but with the Add to Slack button you can get alerts either in channels shared by others or your own personal Slackbot. InVision is a prototyping tool for teams to hash out new designs. Mockups shared with the app can be annotated and comments collected among your team. With the Add to Slack feature, now you can share new designs inside the InVision app directly into a Slack team channel. Box is an online file sharing and collaboration service aimed at business. Once enabled, their Add to Slack feature means you can share things from within Box to your Slack team channels without leaving the app. The Add to Slack button is launching in the following services as well: Intercom, Launchkit, Lever, and Cronitor. The Add to Slack feature isn’t limited to just our launch partners. 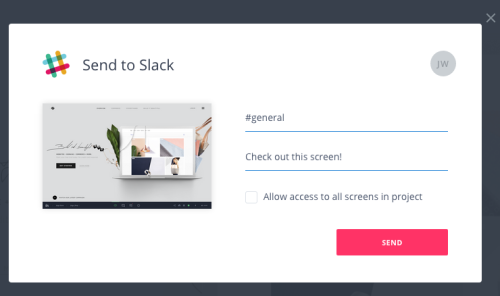 If you run a service or app that periodically sends notifications, or you’d like users to share their work directly into Slack without leaving your app, chances are you could easily make use of this feature. Our documentation on the new Add to Slack feature details the steps necessary to build it into your application today and start offering the feature to your users tomorrow.